Congrats students, teachers and families @anahuacalmecac for rising SBAC performance 2018! 7% increase in EL and over 22% increase in Math overall. 74% of 6th graders Met/Exceeded standards in Math. 44% of 11th grade Met/Exceed EL standards. In 2002 Academia Semillas del Pueblo was founded in protest of and in contest to California’s English Only right wing education laws and policies including Prop.227. Then came NCLB and its national English Only high stakes testing English only hegemony. We resisted both for over a decade, all along facing calls to bomb our school, kill our children, close our schools, and terminate our existence. Just because ESSA, Common Core and CAASPP testing came through the incompetence of the Obama administration as an 11th hour conciliation, does not mean it is any better. Assimilation is not a right, deculturalization does not democratize society and Indigenous language linguicide is not social justice. Indigenous children and youth around the world repeatedly demand a culturally relevant education, heritage/maternal language learning and opportunities to live as whole human beings - as Indigenous Peoples. 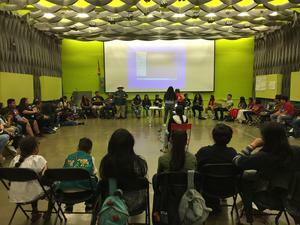 If last years graduation rates hold steady in Los Angeles Unified just finishing school college-ready seems possible for less than half of American Indian students overall. CDE sources report .2% American Indian students of 621,414 students in LAUSD. That means 1,243 American Indian students last year, a drop of 50 students from the previous year. Of these only 3 out of 4 will graduate from LAUSD. And only less than half (43%) will graduate eligible to attend a four-year college or university (UC A-G). Compared to over 50% of white students and over 72% of Asian students in LAUSD. PUT ANOTHER WAY, IT DOESNT PAY TO FORCIBLY ASSIMILATE OUR CHILDREN, unless...that is the plan.